The Sumatran rhinoceros is a small, hairy rhinoceros which survives in limited numbers in pockets of Indonesian and Malaysian rain forests. In the early 1900s it ranged over most of Southeast Asia from the Himalayas in Bhutan, eastern India through Malaysia, Sumatra and Borneo. Now they are only found in little forest pockets on the Indonesian island of Sumatra and the Malay peninsula. 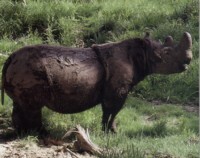 Sumatran rhinoceros has a gray-brown leathery hide. Its deep folds around the neck, behind the front legs, and before the hind legs give the rhinoceros an armor-plated appearance. It has a short, stocky body and stumpy legs which are covered with coarse reddish-brown hair. Its body length is from 8 to 8.5 feet and stands 4.5 feet at the shoulders. A mature rhino weighs from 2200 to 4400 pounds. The Sumatran rhinoceros is the only Asian rhinoceros with two horns. Both sexes of rhinos have horns, the front horn being larger, averaging 15 to 20 inches. The male's horns are usually bigger than the female's, whose second, smaller horn is often absent. The upper lip curves down and can move around to grasp objects. because it survives in small, scattered populations in the thick undergrowth of their rainforest habitat. It is known that the females have territories of about 1.2 to 2.2 miles in diameter that partially overlap with other females. The males seem to be nomadic. The estimated density per animal is approximately one animal per 15 sq. miles in high density areas, and one animal per 31 to 46 sq. miles in low density areas. They live in a variety of habitats, but prefer higher elevations in the mountain moss forests and tropical rain forests with few human developments. The rhinos are most often found near water, and spend much of the day in mud wallows, which they dig out themselves and whose perimeters are kept clean. The wallows help the rhino avoid biting insects and protects them from the heat . Sumatran rhinos are solitary animals who only come together to breed. Breeding of captive Sumatran rhinos has shown that the female will not come into estrus until she senses the nearness of a male. This reduces energy spent on cycling when the rhinos don't come into contact with each other on a regular basis. Gestation is 475 days with one calf per birth. The calf is covered with a dense coat of reddish hair. Calves are weaned at 18 month, but stay close to their mother for 2 to 3 years. Females reach sexual maturity at 4 years, and males take 7 years to reach sexual maturity. Birth intervals between calves is 3 to 4 years. The life span of captive rhinos is around 35 years. Rhinos feed just before dawn and after dusk and move about during the night. The normal diet of the Sumatran rhino includes wild durian mangoes, figs, bamboo and plants species characteristic of disturbed forests. It will knock down saplings to get at the tender leaves. They are very fond of salt licks and each territory will include one. The Sumatran rhinoceros is the smallest and rarest rhinoceros species. There are thought to be only 300 animals still in existence and the IUCN has put it on its critically endangered list in 1996. These survive in very small and scattered populations, their habitat fragmented into smaller and smaller pieces by encroaching human populations. 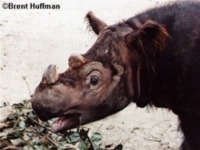 The number of Sumatran rhinos has declined 50% due to poaching in the last 10 years. There are no signs that the situation is stabilizing. Efforts have been made by IUCN to set up a 3 year program for the protection to the Sumatran rhino in Indonesia and Malaysia in the wild. They are seeking to extend the program, whose funding ended in 1998. Captive breeding programs have also been set up, but have not been very successful. Since 1984 40 rhinos have been captured to participate in breeding programs, but 19 of these have died. Artificial insemination efforts have also not been very successful. These failures were the result of lack of knowledge of the diet and reproduction of the Sumatran rhinoceros. Experience so far has shown that the rhinos need larger enclosures with more natural conditions. Time is running out as efforts to save the Sumatran rhinoceros from extinction continue.